A normal memory lapse is forgetting where you left your keys. Serious memory loss is when you forget what a key is. Other warning signs might be wandering or getting lost, forgetting to turn off the stove or having difficulty driving. When memory loss and declining ability to reason are serious enough to interfere with daily life, it is called dementia. Alzheimer’s disease is the most common form of dementia. Dementia can occur in people as young as 50, although it is very rare. As people age, their likelihood of developing memory disorders increases. About 5 percent of people at age 65 have some sort of dementia, with the risk of dementia rising steadily after that. By the time an individual turns 80, he or she has about a 50 percent risk of developing severe memory problems. Dementia robs people of the ability to function independently. Navigating the complexities of daily life often falls to the loved ones of people living with dementia. It truly is a disease that affects the entire family. There is help for people with memory disorders. 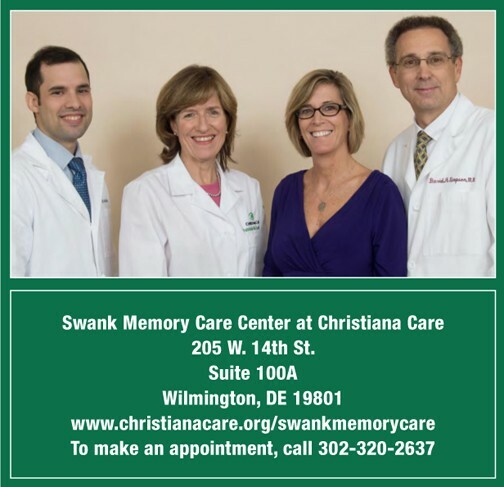 The Swank Memory Care Center at Christiana Care is Delaware’s first comprehensive outpatient program for people with memory loss and support for their loved ones. At the Swank Memory Care Center, our focus is on providing expert, compassionate care for people with memory loss and their families. The team of health care professionals includes doctors who are fellowship-trained and board-certified in gerontology, a nurse practitioner and a senior social worker, who is the program manager. Diagnosing memory problems requires a comprehensive approach. Currently, no blood test or imaging study can detect Alzheimer’s disease or dementia. The medical care team at the Swank Memory Care Center begins the diagnosis process with a comprehensive history and physical examination. Other screenings are used to evaluate the extent of memory loss and check for geriatric depression. A medication review can uncover a drug reaction that may mimic the symptoms of dementia. The expert medical team at the Swank Memory Care Center partners with families to develop the best care plan for patients who are diagnosed with memory loss. We explain the diagnosis to caregivers and provide counseling as well as connections to support groups in the community. By offering all of these services in one location, caregivers don’t have to juggle a lot of paperwork. Our medical staff provides regular reports and updates to patients’ primary care providers and other specialists they might be seeing, such as neurologists and psychiatrists. You don’t need a referral from your primary care physician to make an appointment with the Swank Memory Care Center. If memory lapses are interfering with daily life for you or a loved one, call to make an appointment or to learn more about the program. David Simpson,M.D., is medical director of The Swank Memory Care Center at Christiana Care. To make an appointment, call 302-320-2637.